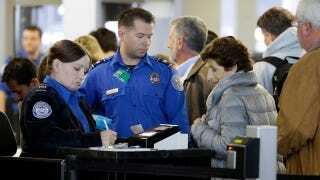 The friendly TSA folks at Los Angeles International Airport denied a woman from traveling on Wednesday because she couldn't speak her name, due to having suffered a stroke ten years ago, according to the Washington Times. Bravo, TSA. Bravo. "He just wanted me to make my sister talk, and I couldn't believe it. I was standing there, tears coming out, and I was like, 'Are you serious? We can't get her to talk.'" Sherry said Heidi, who is also confined to a wheelchair due to her stroke, was forced to endure an 8-hour bus trip to get to Phoenix because the TSA wouldn't let her fly. Sherry added that the agent screening them also came across as rude and insensitive. "I think it could have been handled differently by the TSA, and it probably could have been handled differently by the family. Hopefully, moving forward, the family won't have this problem again because they know about the programs that we have in place." Mr. Martinez did not elaborate on those programs, or what the family should have done differently. Heidi's family in Phoenix claims to have contacted the TSA before she tried to travel, in order to make sure they had everything she needed to fly that day. They have filed a complaint with the Department of Homeland Security.